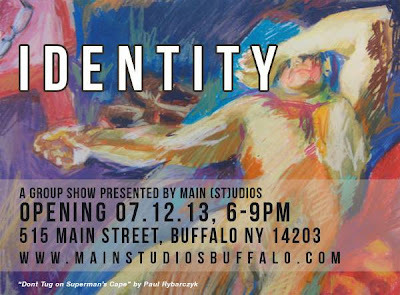 MAIN (ST)UDIOS downtown art center presents a group show conceptualized by resident artist John Dunklemann and curated by resident artist Trinton “TrinityHawk” Garrett around the concept of identity. Work from several different artists of many different mediums will be exhibited. Reception is FREE and open to the public with open mic on the Identity theme and special performance featuring energetic and emotional spoken word art from Pure Ink Poetry and unique refreshments provided by Mixology. Featuring work by Brigid Jaipaul-Valenza, Cari Feltz-Abdo, Heidi Lynn Farrell Brown, Kathryn Eulella Shiver, and Katt Dunsmore, Paul Rybarczyk, and Trinton “TrinityHawk” Garrett . MAIN (ST)UDIOS is located at 515 Main Street, Buffalo, NY 14203. Open hours are Tue-Friday 11AM-5PM and Wednesdays until 8PM.